These quotes pinpoint a triangle of issues: “breakout,” or the months needed for inspectors to detect Iran’s race for the bomb; “sneakout,” or Tehran’s secret enrichment capabilities — a word that implies little-to-no breakout time; and a “sunset clause,” years after which Iran would be free to chart its own nuclear course and imports/exports free of restraints. The main narrative emerging from the breakout debate is a dispute between President Barack Obama and Netanyahu, over his allegation that Obama is willing to accept a breakout time of only six months, or not even a year. The day after the speech, the Wall Street Journal published a piece titled “Iran Talks Closer on One-Year Nuclear ‘Breakout’ Demand.” The article reported that Iran and six major powers are nearing an understanding about a final nuclear deal. “It must be structured around the U.S. demand that Tehran stay at least a year away from amassing enough fuel for a nuclear weapon,” the Journal reported. Robert Satloff, executive director of the Washington Institute of Near East Policy also focused on what he suggests is an overlooked sentence of the speech — its opening. “The key sentence [of the speech] was this: ‘Because Iran’s nuclear program would be left largely intact, Iran’s breakout time would be very short — about a year by U.S. assessment, even shorter by Israel’s,’” Satloff wrote. Netanyahu’s rhetoric suggested that Israeli intelligence doubts Washington’s assessment. How could the United States be sure its estimate of warning time will remain intact in year five or year 10 of an agreement? To ask the question is to answer it. No intelligence is certain. 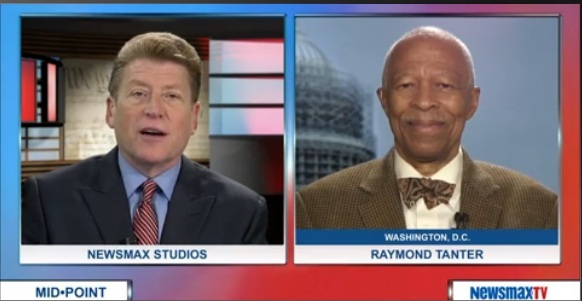 Professor Raymond Tanter appeared on Newsmaxtv on 04 March 2015. The former senior staff member of the National Security Council, Reagan-Bush administration, and an adjunct scholar of The Washington Institute researching U.S. policy will discuss the recommendations Benjamin Netanyahu made in dealing with Iran vs. the reality of feasible options. He’ll also speak about reports and opinion that Iran already has nuclear capability, what the talks John Kerry is engaged in can really accomplish and whether a deal could be trusted if in fact an agreement is met.